THE DECISION-AIDER. Swing the pendulum and it will randomly magnetically end up pointing to your decision. Some assembly required. Each gift boxed with hanging tab. Perfect for party games. RAINBOW NOISE PUTTY. Makes farting sounds when you squish & play with it. Assorted bright colors. Individually shrink wrapped. Each dozen includes display unit. Perfect for Christmas stocking stuffers and party favors. Shoot flying objects into the night sky with this 6-piece Glow in the Dark Spinner Set featuring glowing disks that propel from a handheld launcher. Spinners come in assorted designs. Simply place a spinner disk on the launcher and press the button to eject. Spinners fly up to 20 feet high! For ages 3 and up. Comes packaged in a blister pack. SCENTED SOAP ROSES. On wire stems with silk leaves, these make the perfect token to any loved one. Assorted colors. Each in cello cone. POPPING EYE TRICERATOPS. Give the squishy toy stegosaurus a squeeze and watch his eyes pop out. Each cello bagged. These are the most unique stress balls that you will ever see. Each dozen includes a display unit. Perfect for party favors. 4 PIECE SPIN GEAR TOPS. Just mount the top onto the launcher, install the zip line and pull to set these tops spinnning. Includes 4 tops, zip line and launcher. Some assembly required. Assorted colors. Each blister carded. Perfect for party favors. MINIONS 2-IN-1 PLAY TENTS. You can use these adorable light-weight play forts as a play tent or a bed tent. Easily sets up and breaks down with a simple twist motion of the frame. Mesh windows make fun peek-through play. Folds flat for easy storage. Each gift boxed with handle. PIECE INTERLOCKING BIG BLOCK SETS. In bright colors, these building blocks are perfect for rainy days and play dates. Each set polybagged with header. 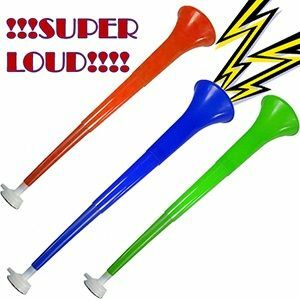 14 INCH PUMP HIGH TONE AIR HORNS. EXTREMELY LOUD! These are perfect for sporting events, clubs and parties. Some assembly required. Each polybagged w/header. TROLLS CANDY FANS. These battery-operated fans have foam rubber blades and handles filled with candy. Each fan has pictures of Princess Poppy or Branch. Batteries included. Perfect for Christmas stocking stuffers, Easter basket treats and party favors. SUPER BOXING CHAMPIONS. These action figure prize fighters are pose-able at the neck, shoulders, elbows, waist and knees. Assorted styles and colors. Each blister carded. Perfect for party favors. Rainbow spring toy, can be played with anywhere, fun for kids,great novelty item. Provide hours of fun for children and adults with this Emoticon Light-Up Yo-Yo featuring a classic yo-yo toy with the design of commonly used keyboard expressions. Yo-yo lights up with a flick of the wrist for a fun, illuminating experience. Learn tricks and amaze friends! Makes a great party favor and stocking stuffer. Comes in assorted styles. For ages 3 and up. Comes packaged in a blister pack. Countdown 60-Minute Kitchen Timer is no exception. This sturdy, accurate and attractive kitchen timer just simply twist dial to desired time. Ideal for events that require a set time such as cooking, game playing, exercising and more. This timer will remind you when your cooking time is done. These yoyos are lots of fun. Nice quality, assorted colors. Do lots of tricks. Fun for adults and children alike. Indoor and outdoor fun. Toy Metal handcuffs with keys. A fun toy for kids who want to play policeman,or cops & robbers. This toy is a great party favor. Lots of fun for kids of all ages.Great for children with an imagination. Use it anytime, anywhere. Perfect for managing your health and knowing your body fat. Digital display. Used for individuals from 10 years-80 years old. Battery may need to be replaced. We will provide a replacement battery for every unit you purchase. This Magic Cube is lots of fun for children and adults of all ages. Challenge your brain. Hours of fun. This speed cube makes solving the puzzle easy as well as easier to maneuver. Dimensions: 3"x 3" x 3"
Perfect for costumes and pretend play, this Ninja Weapon Cuffs Set features black foam wrist cuffs with a removable knife and ninja star. One size fits all. For ages 7 and up. Comes packaged in a poly bag with a header card.